� Hyden's first five partners on the beach were all former teammates from his Indoor Olympics, and in total he has played with six different former U.S. National Team teammates. � In his 11 times playing domestic events in Cincinnati and Mason, Ohio, Hyden won six times. � In Berlin in 2014, Hyden and Tri Bourne won the gold medal after emerging from the qualifier. Hyden became the oldest player to win (41 years, 8 months, 15 days) and it also marked the largest age differential in winning partners as Bourne was 25 years, 0 months, 2 days old. � Hyden won the first 24 of his 26 career victories in team events alongside a partner who was from Hawai'i. � Hyden is the oldest player to ever win an AVP event (last done in Hermosa Beach 2018 when he was 45 years, 9 months, 22 days old). It was his fifth AVP victory since turning 40. 2018: Hyden and Theo Brunner played five times on the AVP Tour, winning in Hermosa Beach and placing third three times. Hyden closed the season with a 17th-place finish with Duncan Budinger. Hyden ended the year ranked eighth in digs (4.29 per set). Hyden and Brunner played in seven FIVB tournaments together, finishing fifth twice. 2017: Hyden and Ryan Doherty played five AVP events together, winning once and finishing second once. Hyden was second on the Tour in digs (5.08 per set). On the FIVB Tour Hyden and Doherty won a silver medal in their six events together. 2016: Hyden and Bourne finished second in both of their AVP events. On the FIVB Tour Hyden and Bourne played 17 times, winning a silver medal and three bronzes. The duo ended the Olympic qualification as the third highest ranked U.S. men's team and 15th overall. 2015: Hyden and Bourne made it to the semifinals in all four of their AVP tournaments, winning twice and finishing second once. The duo played in nine internation al events, with a best of fifth three times. 2014: Hyden and Bourne advanced to six semifinals in their seven AVP tournaments. They won once and finished second once. Hyden and Bourne played 11 times on the FIVB Tour, winning a Grand Slam in Berlin. 2013: Hyden formed a partnership with Tri Bourne, playing in seven AVP events together. The pair finished second twice and third twice. Hyden and Nick Lucena played in five FIVB Tour events, with a best of 17th. 2012: Hyden and Scott won one of their two AVP events together. They also won five times in seven events on another domestic tour. 2011: Hyden and Scott finished second in the only AVP tournament of the year. They played 10 other domestic events on three different tours, winning eight times. Hyden and Scott also played in two FIVB events, with a best of 17th. 2010: Hyden and Scott advanced to six semifinals in their seven AVP tournaments, finishing second four times. The duo also played one other domestic tournament, which they won. 2009: Hyden began playing with Sean Scott, and they advanced to the semifinals in 12 of their 15 AVP events. They won four times, finished second four times, and placed third four times. Their wins and semifinal appearances both ranked second on the Tour. 2008: Hyden and Keenan played 17 times together on the AVP Tour, placing second three times and third five times. For the second straight year, he won the individual event. 2007: Hyden played twice with George Roumain, getting a best of seventh. 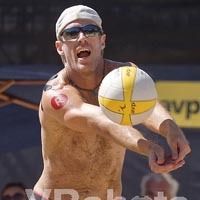 He then formed a partnership with Brad Keenan, playing 15 AVP events together. THe duo finished second once and third five times. Hyden was named God of the Beach in Las Vegas. He ended the year ranked fourth in hitting percentage (.435), seventh in digs (4.58 per game) and 10th in aces (.48 per game). 2006: Hyden and Jeff Nygaard played in 15 AVP tournaments together, finishing second once and third five times. Hyden ended the year ranked fifth in digs (4.82 per game) and seventh in hitting percentage (.440). 2005: Hyden paired with Brent Doble for five events with a best of fifth. He then played three times with Mike Lambert, winning in Cincinnati after knocking off five of the top six seeds. For the last four AVP events he played with Adam Jewell, getting a best of fourth. Hyden finished the 2005 season ranked seventh in aces (51). 2004: Hyden played eight AVP events with Andy Witt with a best of fifth among their seven top-10 finishes. Hyden played once with Mike Lambert, finishing second. 2003: Hyden began the year with two events alongside McCaw, advancing from the qualifier and finishing 17th both times. For the next six tournaments he turned to another former U.S. National Team member, Andy Witt. The duo had a best of fifth to go with two ninths in their six AVP tournaments together. 2002: Hyden played with another former Olympic teammate, Chip McCaw. They played in four AVP tournaments, with a best of 17th three times. The duo also played eight times on the FIVB Tour, getting a best of 17th twice. 2001: Hyden began his pro beach volleyball career playing alongside two former U.S. National Team members. He played a domestic event with Dan Landry, finishing fourth, then played his first AVP tournament with Jeff Nygaard, losing in the qualifier. College: Hyden graduated from San Diego State University where he received team MVP honors all four seasons. He was a two-time First-Team All-American for the 1994 and 1995 seasons, led the nation in kills per game, and had an NCAA record 56 kills in one match. Before his successful transition to the beach, Hyden had an outstanding indoor career where he was a member of the United States National Team for five years (1995-2000) and was an outside hitter on the 1996 (placed ninth) and 2000 (placed 11th) Olympic Teams. In 1996, he was voted the team MVP. He also played professionally overseas in Italy, for two seasons, Brazil and Saudi Arabia. Personal: Hyden was born to Claudia and David Hyden. At the age of two, Hyden lost his father in a military accident, and was raised alone by his mother. He grew up playing sports with his older sister Joyce and younger brother Matt. Hyden and his wife Robyn have a daughter, Samantha, born in June 2006, and a son Jackson, born in 2013.